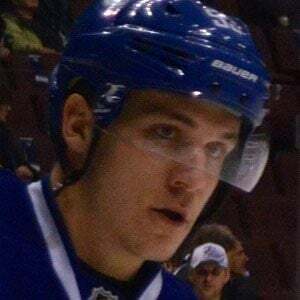 Hockey centre who was drafted by the Vancouver Canucks in the first round of the 2013 NHL Entry Draft and made his NHL debut the next season. In 2012, he won gold medals representing Canada at the Ivan Hlinka Memorial Tournament and World Under-17 Hockey Challenge. He grew up a Detroit Red Wings fan in the farming town Rodney, Ontario. He won the Wayne Gretzky 99 Award as the MVP of the Ontario Hockey League playoffs as a member of the London Knights. His father Tim also played for the London Knights. His younger brother Cal is also a hockey player. He has been coached by Brent Sutter on Team Canada.